Next up on the list is 2-node direct connect. What does this mean? 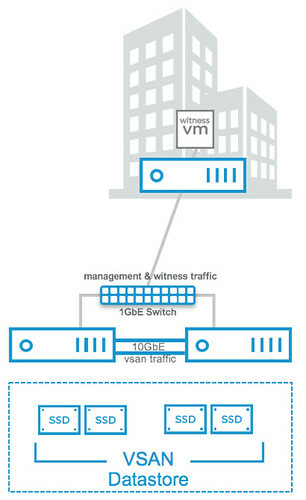 Well it basically means you can now cross-connect two VSAN hosts with a simple ethernet cable as shown in the diagram in the right. Big benefit of course is that you can equip your hosts with 10GbE NICs and get 10GbE performance for your VSAN traffic (and vMotion for instance) but don’t incur the cost of a 10GbE switch. Then there is the support for 512e drives, note that 4k native is not supported at this point. Not sure what more to say about it than that… It speaks for itself. Oh and one more thing… All-Flash has been moved down from a licensing perspective to “Standard“. This means anyone can now deploy all-flash configuration at no additional licensing cost. Considering how fast the world is moving to all-flash I think this only makes sense. Note though that data services like dedupe/compression/raid-5/raid-6 are still part of VSAN Advanced. Nevertheless, I am very happy about this positive licensing change! 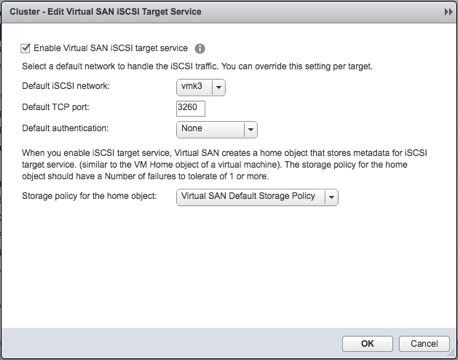 Does the physical servers connected to VSAN iSCSI Devices require a VSAN License? No it does not. It just connects over iSCSI, no additional licenses needed for that. It’s now possible to configure erasure coding when using multiple fault domains? Do you think this volumes can be mapped directly to a VM, like a RDM? That can be useful when you have a legacy Microsof Failover cluster who need shared disks. not like an RDM, but you create an in-guest iSCSI based solution. So you connect to the iSCSI LUN from within Windows, which then becomes a new block device for your VM and can be used as a quorum. This was one of they key reasons to develop this feature. It’s possible to test it on the Hands On Lab? 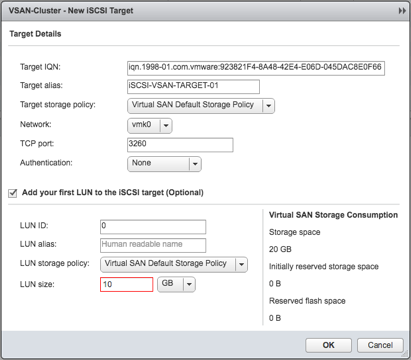 Why can you not use the iSCSI target with vSphere – this seemed like a great use case to me (i.e. you had some legacy hosts or hosts with minimal storage requirements)? It is not the intended use case for this feature. This may or may not change over time depending on feedback and requests. I assume it would work with vSphere, but it would not be supported – is that correct? I can’t say at this point, these details will be made available at the time of release. Does ROBO now support all flash? Yes it does, and also a new ROBO Advanced Pack will be made available for those who want to use dedupe and compression. Will vSphere 6.5 include a dedicated TCP/IP stack for the Virtual SAN traffic? Makes sense to configure the direct connection as jumbo frames (MTU 9000). Did You know about release date? So will VSAN be supported in the Essentials Plus license? As this would make for a killer SMB setup. Just want to verify that this does not connect iSCSI storage, just allows iSCSI LUNs to be created and shared to outside devices… sort of a scale-out model I would guess? Can we upgrade the 2-node direct connect configuration to more modes without reinstallation and dowtime ? Quick question about your great post. For a ROBO deployement, Does the link between the ROBO cluster and the witness appliance need to be 10G or can I go with 1G ? My concern was about performance impact.